Today, we are here to introduce our JBL 4344 which we purchased from the US Factory of Kenrick Sound. The speakers came from Chicago, Illinois, crossing the border and through Winnipeg and the prairies, over the Canadian Rockies to our house in Richmond, BC. When they arrived we found the crates were made so solid and the packing so secured, in spite of the long haul delivery by truck, not one tiniest scratch were made to the speakers. The speakers’ enclosures were made by Mr. Rick Riessen, and inside the speaker units, the woofer and mid-bass were re-coned with genuine JBL parts. Unlike the usual walnut being used for JBL4344s, the Burmese Teak Veneer was used for the speakers` outside appearance. I hope you can see the continuous grain from side to top to side again, and also the detailing of the finish. The baffles are textured in black with the attachment and the speaker grill fabric also in black. This colour coordinate matches our furniture which, we think, creates a calm presence of mind. Also, the speaker comes with custom made 3145 networks and rhodium-plated speaker terminals. Although currently it is driven by a relatively small powered amplifier, since the speaker efficiency is so high, in spite of the small output power by low volume setting, the sound is very powerful. We are enjoying all types of music such as classical, popular and jazz to name a few, but the sound that comes through these speakers are bold and clear, and is distinctively JBL sounds. Next, we would like to show you the speakers with the grille fabric on. We like it the way the speaker blends in with our other furniture. Since the speakers are so huge, and with the limited space, obviously we did not have much option where to set them. The listening room is adjacent to the dining area and between the two, the combined area totals to about 400 sq ft. The room gives out a live house effect and lets out a slight echo. The sound also varies depending on the listening position, but based on the current arrangement, it is best heard 15 ft from the front of the speakers. This JBL 4344 was reproduced by Mr. Riessen, who has a long experience as a woodworker, which shows excellent finishing to the smallest details and is indeed a product of superb craftsmanship. 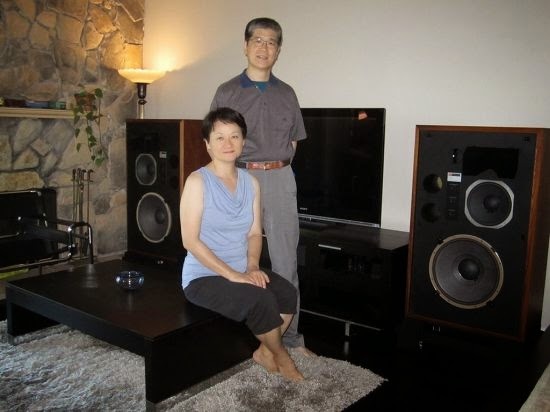 We feel very fortunate to have come across these speakers. We are sure to cherish them for long years to come. Once again, we would like to thank Mr. Kenji Hosoi, Mr. Rick Riessen and all the staff at Kenrick Sound.